Congrats!!! I wish I was in the area. Take photos of the show! Oh how exciting! I used to live in Seattle, I know right where you will be! Wish I could stop in! Have fun and good luck! Beatrice! This illustration of yours is impressive! 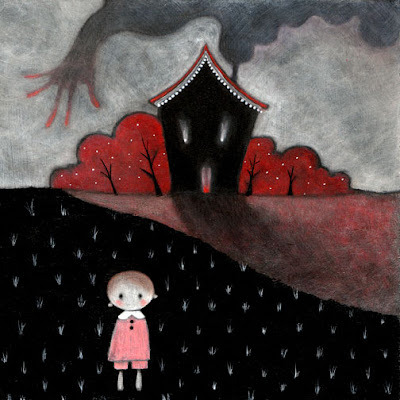 I love it's black ground, red + gray combination and the smoke hand on the sky, it's great! I'm excited for tonight's show! @E.K. : I'll be there taking photos and will post them to the facebook event page. bonjour béatrice, ton blog est adorable ainsi que tes peintures. je t ai choisi pour recevoir un «lovely blog award». viens me visiter pour plus de détails. acabo de descubrir tu blog y me encantan tus trabajos. Saludos. This illustration of yours is impressive! I love it's black ground, red + gray combination and the smoke hand on the sky, it's great! Wow,absolutely fantastic blog. I am very glad to have such useful information.